These may work fine if you are a newspaper publisher, but a books publisher would most likely prefer terminology such as Project, Book, Chapter, and Status instead. By using this method, the terminology for all Brands on one particular Enterprise server is changed. Note: To set up different Brands using different terminologies, create a separate Enterprise Server installation for each change of terminology. Step 1. Make a backup of the current configlang.php file. Step 2. Open the configlang.php file. Step 3. Locate the section function getUiTerms(). Note: See the section below about using Unicode characters. Step 5. Save the file in plain text (ASCII) format. Accented characters (this might be converted to Unicode by your editor without you being aware of this). When used — and the editor saves a UTF BOM marker at begin of the file — all SOAP clients will stop functioning and all Maintenance pages will show some garbage characters at the top of their page. Step 2. Type the character you want to use. Step 4. Click on the character that is found. Example: When searching for ó, U+00F3 is found. Step 5. Scroll down to the Encodings list and search for UTF-8 (hex). Step 6. Copy the displayed value. Example: The UTF-8 (hex) value for 00F3 is 0xC3 0xB3. Step 8. Save the file. The accented character has now been written as a multi-byte UTF-8 character, but the configlang.php file is still in ASCII format. 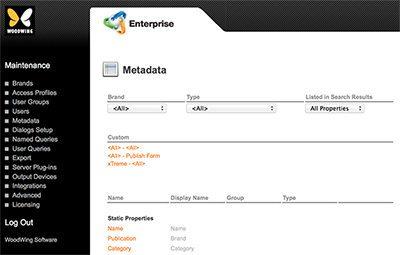 Terminology can also be changed by modifying the static metadata properties that are stored in the Enterprise database. Note: This modification will affect all Brands within the Enterprise Server. To set up different Brands using different terminologies, create a separate Enterprise Server installation for each change of terminology. Step 1. Access the Metadata page. 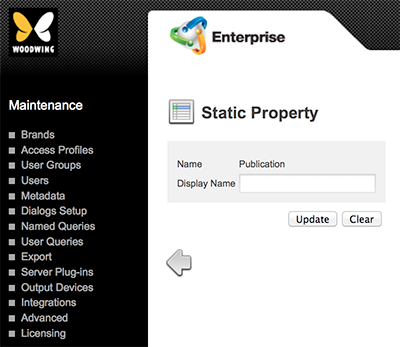 In Enterprise Server, click Metadata in the Maintenance menu or on the Home page. Step 2. In the the Static Properties section, click the name of the Static Property that needs to be changed. The Static Property page appears. Step 5. Repeat Steps 2–4 for all Properties that need to be changed. The terminology can also be changed on a per-language basis by modifying each individual language file of Enterprise Server. Step 1. Make a backup of the current file. Step 2. Open the file in a text editor that supports UTF-8 encoding. Step 3. Edit the terminology as required.